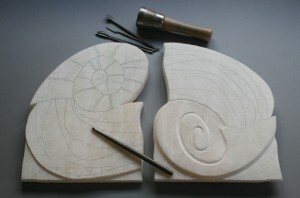 Here is the current work in progress at the start of my carving season – Diving for Pearls, a diptych in alabaster. The design has been marked out on both slabs, outlines established and detailed carving work commenced. When completed and polished, the carved panels will be mounted in an upright position with acrylic on a hardwood base.